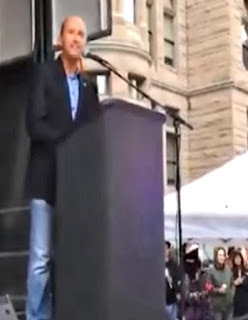 The Eloquent Woman: Famous Speech Friday: Utah Lt. Gov. Spencer Cox: "My heart has changed"
Famous Speech Friday: Utah Lt. Gov. Spencer Cox: "My heart has changed"
Every speaker has to, at some moment, contemplate saying their thoughts out loud, in front of a crowd, rather than keeping them to herself. So a translation occurs, much of the time: Your silent fuming gets toned down a bit, your doubts are shelved, and the words you say reflect other realities than your own, particularly if you are a public figure or elected official. The result, often, are official speeches that lack personality and opinion, the qualities that make you stand out from the crowd. They lack, for lack of a better word, zing. They fail to resonate. There's the opposite problem, too, one with which we are all too familiar in the U.S. during this presidential election cycle: The ceaseless barbs, insults, charges, and sharp retorts that help differentiate one candidate from another. These remarks, the opposite of bland, also can descend into being just noise. But you can throw both those approaches into the trash, as far as I'm concerned, if you have a speech like this one up your sleeve. This is everything you might wish for in a politician's speech after a tragedy, but rarely get. Utah Lieutenant Governor Spencer Cox, like so many public officials this week, gave remarks at a public vigil for the shooting victims of the massacre at an Orlando, Florida, gay bar. The vigil took place in Salt Lake City, 2,300 miles from Orlando and a cultural world away. Before his remarks, the nation had heard a hate-filled rant from a Christian pastor who said the deaths of so many gay people was "good news," denials that the club was a gay club, and statements from other public leaders who carefully failed to mention that the victims of the shooting were gay. Usually when tragedy occurs, we see our nation come together. I was saddened, yesterday to see far too many retreating to their over-worn policy corners and demagoguery. Let me be clear, there are no simple policy answers to this tragedy. Beware of anyone who tells you that they have the easy solution. It doesn’t exist. And I can assure you this — that calling people idiots, communists, fascists or bigots on Facebook is not going to change any hearts or minds. Today we need fewer Republicans and fewer Democrats. Today we need more Americans. This series features famous speeches by women, so when I make an exception for a man's speech, it's one that has particularly caught my ear and had a special impact. What can you learn from this famous speech? Be the contrast to the prevailing tone: This speech has added heft and weight precisely because it's coming from "a balding, youngish, middle-aged straight, white, male, Republican, politician" at a time when others with that description were avoiding the topic, or unmoved because of their position on gay rights. There are more contrasts: It's a quiet speech, not a hate-filled rant. It took place in a conservative area of the United States. It's a bold move to speak in such opposition and contrast, but when you can pull it off, it works wonders for a speech. Pose the questions: Letting your speech be the vehicle for questions that need to be posed is another effective rhetorical device. Here, Cox loads them into a potent paragraph: "I truly believe that this is the defining issue of our generation. Can we be brave? Can we be strong? Can we be kind and, perhaps, even happy, in the face of atrocious acts of hate and terrorism? Do we find a way to unite? Or do these atrocities further corrode and divide our torn nation? Can we, the citizens of the great state of Utah, lead the nation with love in the face of adversity? Can WE become a greatest generation? I promise that we can, but I also promise that it will never happen if we leave it to the politicians." Each question contained his hopeful vision, but turned it into a challenge and call to action, bringing the audience along for the ride. Use that vertical pronoun: Politicians say "we" a lot, a cheap and easy way to assume that their audience is with them. Here, Cox makes particular use of the pronoun "I" in places where it really counts. It is clear, throughout, that this is as much a personal pledge for him as a political statement, something which stood him in good stead at a time when other leaders were sharing non-committal "thoughts and prayers" in their statements. The impact is telling. This speech may have avoided all the doublespeak because Cox had little time to prepare. He was due to be more than 200 miles away at another event, but canceled that appearance when invited to speak at this vigil. He showed up in jeans and sneakers and a jacket, not his most formal attire. He wrote these remarks himself, in under an hour, even though he rarely writes down what he is going to say. Cox says he thinks the speech was heard nationwide might be due to the fact that it's not political and loaded with talking points. And you'll hear him choking up in all the right places. I'm not in his party, nor his state, but this is one politician I hope keeps speaking his mind and heart. We need more of this kind of public speaking just now.